his exceptional debut album, now available again with the addition of five previously unreleased takes and alternate version. This is Chicago style harmonica blues at its best! CAREY BELL - hca/voc, JIMMY DAWKINS, EDDIE TAYLOR, ROYAL JOHNSON - gtrs, PINETOP PERKINS - pno, JOE HARPER - bass, WILLIE WILLIAMS, SIDNEY THOMAS - drums. SOMETIMES THE RIGHT WORDS CAN BE HARD TO FIND AT A FATHER-AND-SON REUNION. They may resort to non-verbal methods to express the special bond that exists between them, to convey love without actually uttering the word. In the case of the two blues legends featured on this disc-harmonica virtuoso Carey Bell and his brilliant guitar-playing offspring Lurrie-the easiest way to grasp how they feel about one another is by watching and listening to the spellbinding blues they play together. In front of packed houses at a pair of 2006 Chicago shows at Rosa's and Buddy Guy's Legends, the com-munication lines were so wide open between the pair that it rendered verbiage superfluous. The amazing aspect of their July 27 gig at Rosa's Lounge is that Carey made it at all. Illness nearly forced him to remain at his Charlotte, N.C. home instead of making the trip north. "Carey had a stroke and fell and broke his hip. Literally, he was in the hospital four weeks. I picked him up Friday, took him home, and we were in the car by Monday going to Chicago; says his North Carolina-based guitarist, Scott Cable. "The Friday I went to get him out of the hospital, I walked in and I was wearing shorts. And the first thing he did was laugh at my legs, and the second thing he said was, 'How are we gonna get this wheelchair up on stage?" Just as wondrous as the harpist's steely resolve to join his son for the show and these recordings is the fact that Carey was clearly at the absolute top of his harp-blowing game. He • was so pleased to be playing in front of friends and family that he debuted a new song con-ceived especially for the occasion. Gettin' Up conveys the major lift he was feeling from play-ing his blues, and it's an apropos title for this collection. "Carey was talking to people, because he knew the people were wondering how healthy he was, and they were worried. And he wrote that song in the hotel the night before; says Scott. "What a great tune. I said, `When'd you do that?' He said, 'I wrote it last night!'" Long celebrated as a blues harp master, Carey is a direct stylistic descendant of Little Walter and Big Walter Horton who came up hellbent on inventing his own signature flour-ishes on the instrument. Born November 14, 1936 in Macon, Miss., he started playing harp at age eight and gigged with the combo of his "adopted stepfather; pianist Lovie Lee, in Meridian when he was 13. The pair arrived in Chicago during the mid-'50s, Carey getting his feet wet playing on the streets and occasionally in South and West Side taverns. "I caught hell for a while; he told me a few years ago. "I wasn't old enough to get into the dubs. I kind of caught it rough. I had to get a day job and all that stuff. But sometime I could slip in. I used to play out in Gary in them roadhouses, and I could get in out there." Soon he encountered the great Little Walter. "He was the king, you know; said Bell. "There ain't nobody playin' like that now. I met him in Chicago on the West Side at a dub called the Zanzibar. He taught me a whole lot of stuff too." Horton was another major influence on Carey's emerging approach. "I believe I know more of Big Walter's stuff than I do Little Walter's stuff," he said. "But I changed it though. Because I wanted to try to find me a style of my own. So I don't know what I did, but everybody says I sound different." For a time, Carey played bass guitar to augment his musical income. "I picked the bass up after I got to Chicago. At one time, harmonicas had died down in Chicago. They wasn't using harmonica players. They used sax and all that kind of stuff. Walter, James Cotton, and Junior Wells, they were doing pretty good. But being that I was a newcomer, I was catching the devil, he said. "You know Honeyboy Edwards? I was staying with him for a while. I was banging around on his guitar, and that's how I learned how to play bass-on his guitar; Carey noted. "Big Walter was the first guy I played bass for, after I caught myself learnin'." Carey played his electric bass behind slide guitar great Robert Nighthawk on Maxwell Street, but the switch wasn't permanent. 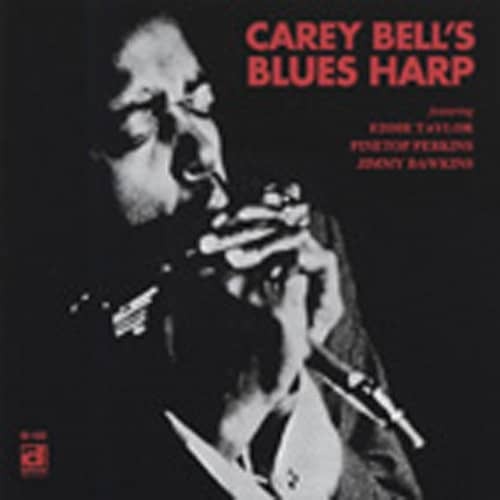 He made his first album, Carey Bell's Blues Harp, in 1969 for Delmark. Carey spent time in the bands of Muddy Waters and Willie Dixon during the '70s, developing a sound as distinctive as that of his idols. He also sired 15 children, sever-al of whom became blues musicians themselves. In addition to Lurrie, born December 13, 1958, there was Steve (who picked up the harp like his old man), bassist Tyson, and drummer James. The first time a teenaged Lurrie ever played guitar in a studio was on Carey's '77 album for producer Ralph Bass (unissued then, it's now available on Delmark as Heartaches and Pain, Delmark 666). The next year, he pulled double duty on Alligator's Living Chicago Blues anthologies, backing Carey on the first volume and teaming with harpist Billy Branch to head the new generation Sons of Blues on the third installment. Lurrie played in Koko Taylor's Blues Machine for a year-and-a-half and teamed with Carey to wax a 1984 album for Rooster Blues, Son of a Gun, that deftly exhibited their musical empathy. Customer evaluation for "Blues Harp"